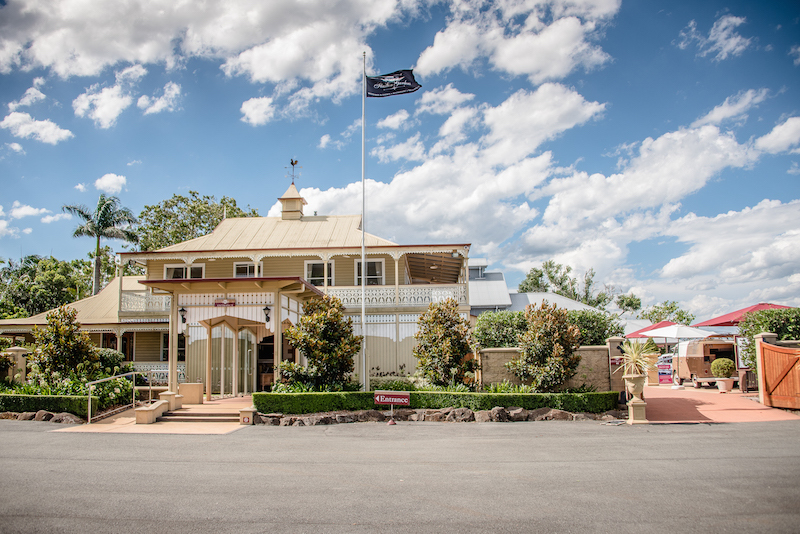 One of the hinterland’s longest standing venues, the iconic venue still flaunts some of its original colonial structure in the historical homestead. Set on acreage, the property now has all the mod cons for comfort as well as charm. Flaxton Gardens is known for its fabulous food and the ultimate romantic setting for a wedding on the range. 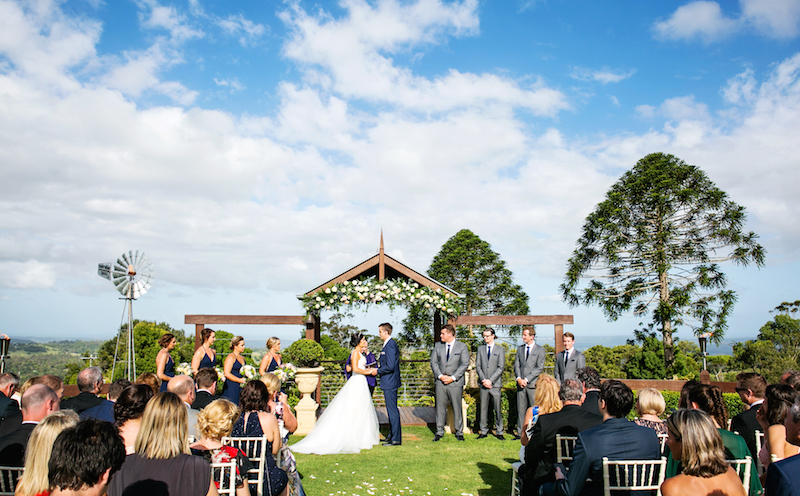 Flaxton Gardens is famous for its incredible views all the way to the coastline, which provide the perfect backdrop for the wedding ceremony where you want to feel like you’re a world away from the everyday. There are multiple options –the more country feel complete with charming windmill, or the uninterrupted clean views. For a more intimate ceremony, the Restaurant Gazebo is a quaint option, which is well protected. This is a lovely option for an elopement. If wet weather arises, the Barrel Room allows complete confidence your ceremony will go ahead as planned. Recently renovated, the Winery at Flaxton Gardens remains the most popular space for a wedding at Flaxton Gardens. Couples love the rustic elegant vibes with plenty of space for up to 350 guests. Sit-down dinner or cocktail receptions are on offer. The Barrel Room is the foyer to the Winery and is an ample space for guests to chill out in comfort. Light and bright, the Restaurant dining room is perfect for a more intimate wedding of up to 60 guests. Your guests will appreciate the fine dining with menu designed by chef and owner, Alan Thompson and the restaurant’s head chef. The pair take their inspiration from the wealth of fresh produce available in the hinterland region. Onsite at Flaxton Gardens, there is a photo op with every turn of the head. 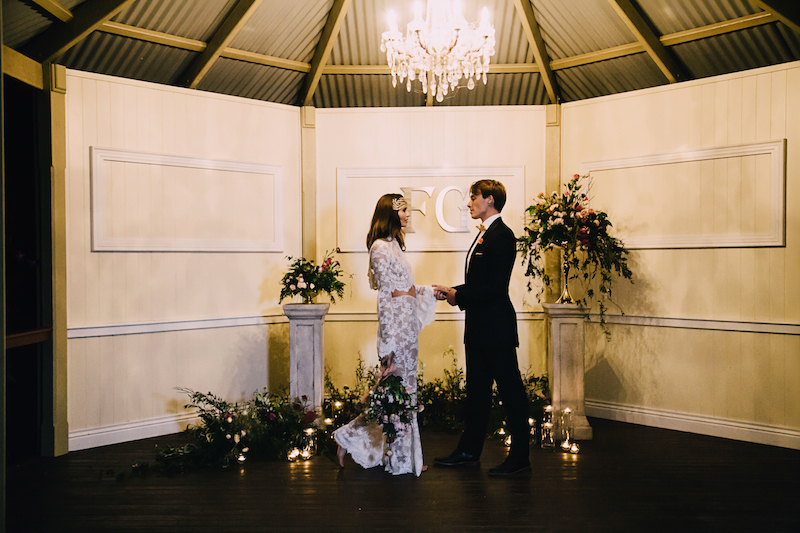 The Gazebo can be utilised as both a ceremony spot and a sweet space to have photos. Make sure to take a stroll in the vineyard for some sweet shots. Of course you can’t go past the views of rolling hills over the hinterland all the way out to the ocean and Moreton Island. The Sunshine Coast hinterland is lousy with pretty places your photographer will definitely have already scoped out. The iconic One Tree Hill is always a popular spot to take photos with the backdrop of the Glass House Mountains, there are pretty gardens galore, there’s even a secret tree-lined driveway that all the local photographers seek out to get the perfectly lit shot. Take a moment to have a sneaky photo under the festoon lights outside under the expansive sky. On a balmy night, with a light breeze coming up over the hinterland hills, you won’t find a more romantic setting. For more information on weddings at Flaxton Gardens, get in touch with their professional wedding team.